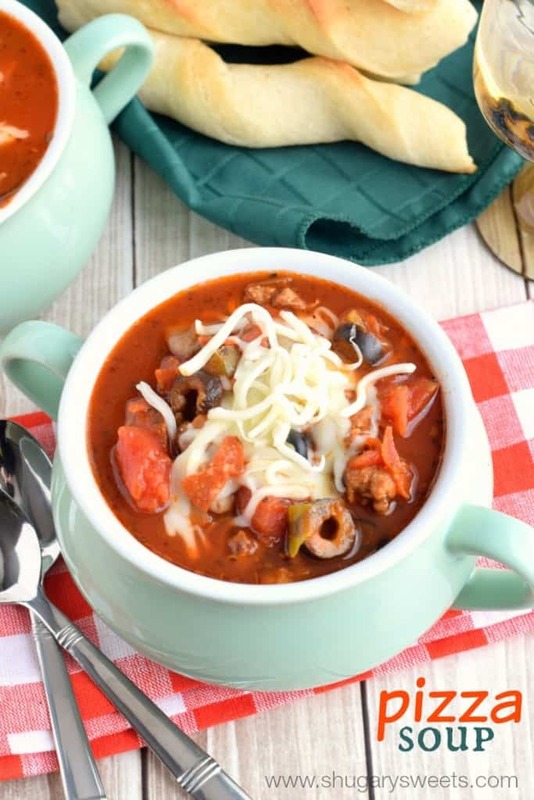 This Slow Cooker Pizza Soup has so many wonderful flavors in one bowl of comfort food! Perfect on a chilly night! Living in Chicago we are blessed with some of the best pizza on earth. I don’t want to hear from you New Yorkers about your folded over cardboard, haha, you’re not going to convince me or turn me to the dark side! However, we have our own internal squabbles here in Chicago…which pizza place is better? And there are so many many places. I grew up eating Aurelio’s Pizza….and if we had one near where I live that’s what I would eat every Friday night! Typically if my family craves deep dish pizza, we make our own Chicago Style Deep Dish Pizza recipe. I wondered what would happen if we took our favorite pizza and made soup! 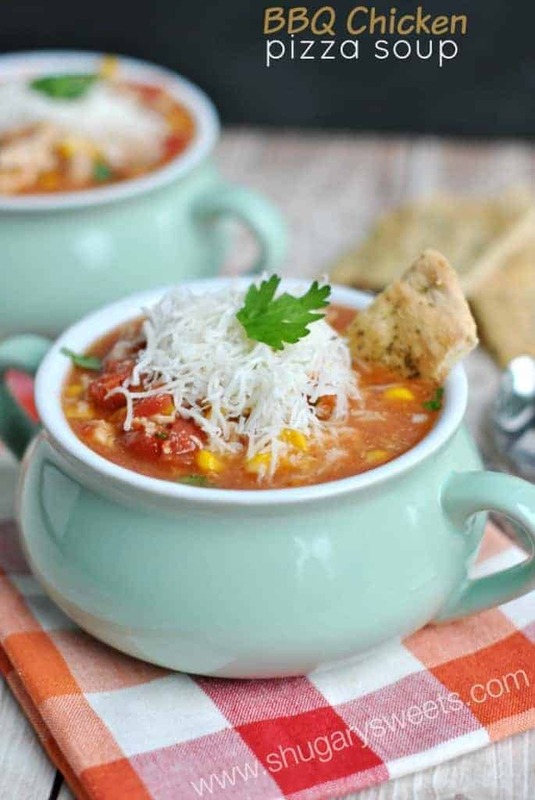 This soup recipe is very customizable to your favorite pizza topping. And the best part is it’s made in the slow cooker! First though, if adding sausage, you’ll need to brown it. Thankfully my Ninja Slow cooker has a setting to saute the meat before turning it on slow cooker mode. 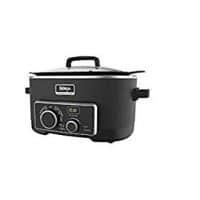 If your crockpot can’t do that, just brown the sausage in a large skillet on the stove top, and remove the excess fat. Add all the remaining ingredients (except cheese) to the slow cooker with your meat. Turn on low for 6-8 hours. 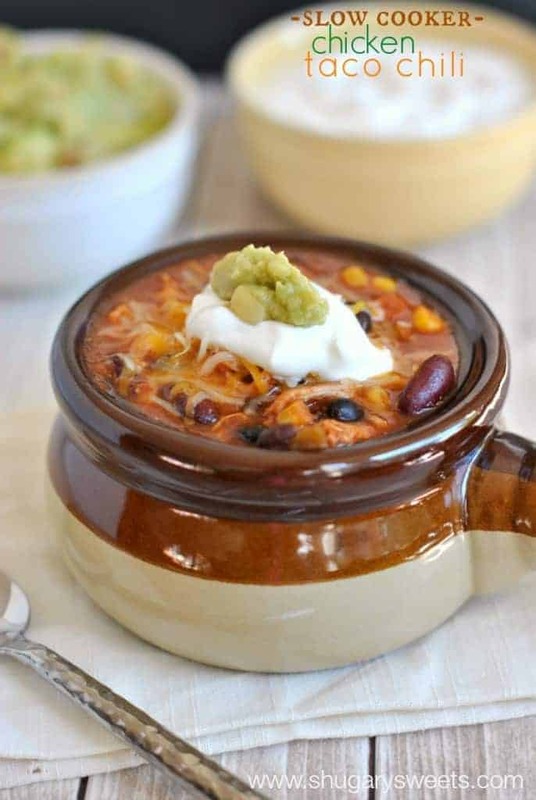 When ready to serve, ladle soup in bowls and top with shredded cheese! I love soup this time of year. Especially when it can be made in the crockpot! That’s a double win in my book! Today’s recipe is like a “SUPREME” pizza soup. But feel free to add/remove ingredients for your family’s tastes! I whipped up a side of easy refrigerated breadsticks to enjoy and dunk in our soup. Perfect. 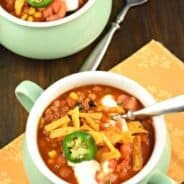 Slow Cooker Chicken Taco Chili: combines the love of tacos in the comfort food of chili! 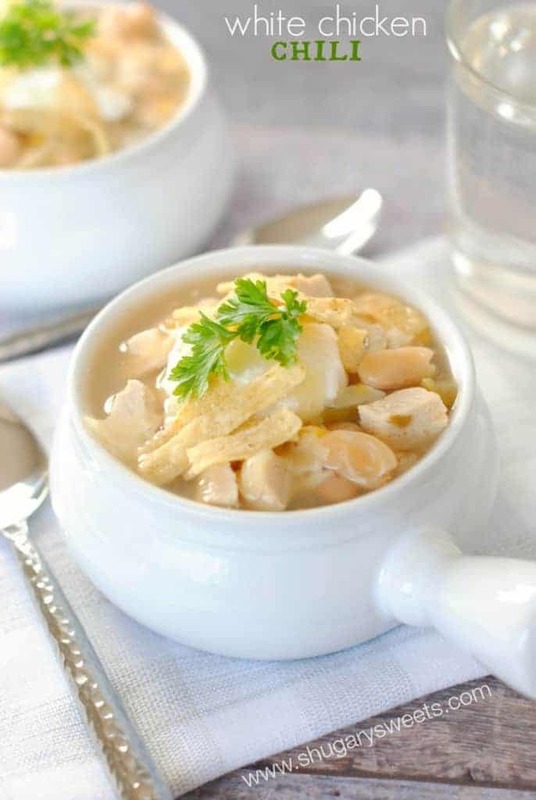 White Chicken Chili: for a healthier twist, this chili may have less fat, but you will LOVE the flavor! 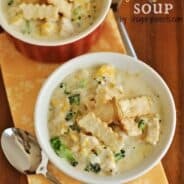 BBQ Chicken Pizza Soup: another delicious pizza soup recipe! Serve with easy pizza crust dippers! 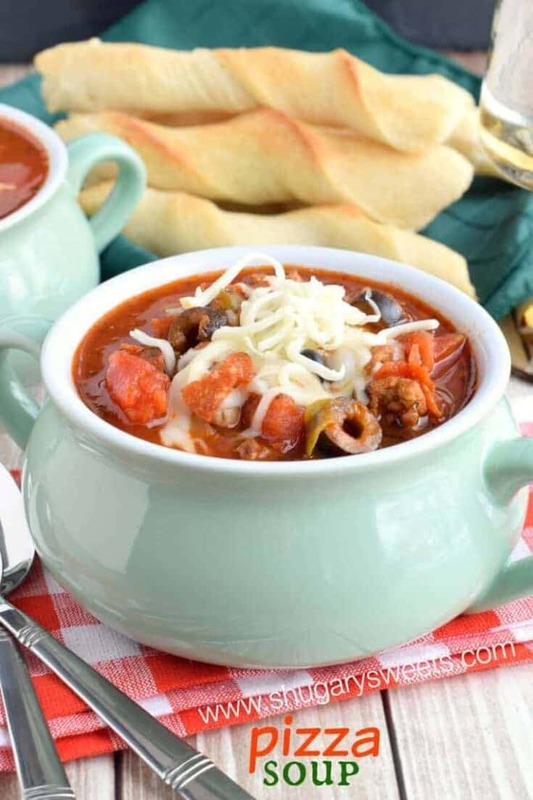 Easy Pizza Soup recipe served in the slow cooker! In a large skillet, cook and crumble Italian sausage over medium high heat. Remove and drain off fat. In a large crockpot, add all ingredients except the cheese. Cook on low for 6 hours. When ready to serve, top each bowl with shredded cheese. ENJOY! This sounds amazing right about now! Pinned it! I love love deep dish pizza! And the more cheese the better! This soup look really good, Aimee! All this pizza talk is killing me!! I’m on low carb diet right now…so thank goodness for this soup! This soup sounds like my family will love it!! I have to try your deep dish pizza!!! You crack me up, Aimee! I love a good pizza and feel as though I should travel to Chicago just to get one. Until then I’m going to enjoy this soup. I looks incredible! My husband sometimes does commentary about what I can or should post. It is funny to have him so into it and at others times not so much. I completely agree about NY style pizza. One of the best things about living in the Chicago area (i’m in the southwest suburbs) is the great pizza. If you have one nearby I would recommend Beggar’s Pizza. Their regular (non-Chicago style) is a thin crust and it’s to die for. They have a Chicago style and a stuffed also, but my fave is the regular. Oh. My. Gosh. I sooooooo miss Aurelios pizza !!!!!!!! I can still remember going tot he original one in Homewood. Living in South Texas good deep dish pizza is really hard to find, like non-existant. Once or twice a year we will order Lou Malneti’s thru the mail. Haha, I grew up in Homewood so we spent many nights hanging out at Aurelios 🙂 Thanks for pinning Pam! Aimee this soup looks amazing! Yum I want a bowl right now. I am jealous, we don’t have any great pizza places out here in little old desert California. I am so missing out. I need to take a vacay soon huh? 😉 Pinned. I think you do need to head out here! BlogHer Food November 🙂 Thanks for pinning! We’re headed to Chicago this summer and I can’t wait to hit up those two pizza places! The soup looks delicious, too! It’s a good thing I don’t have a pizza place within walking distance of my house, I would surely weigh 10,000 pounds! I can’t wait to try this soup. I love soup, but my husband isn’t a fan. 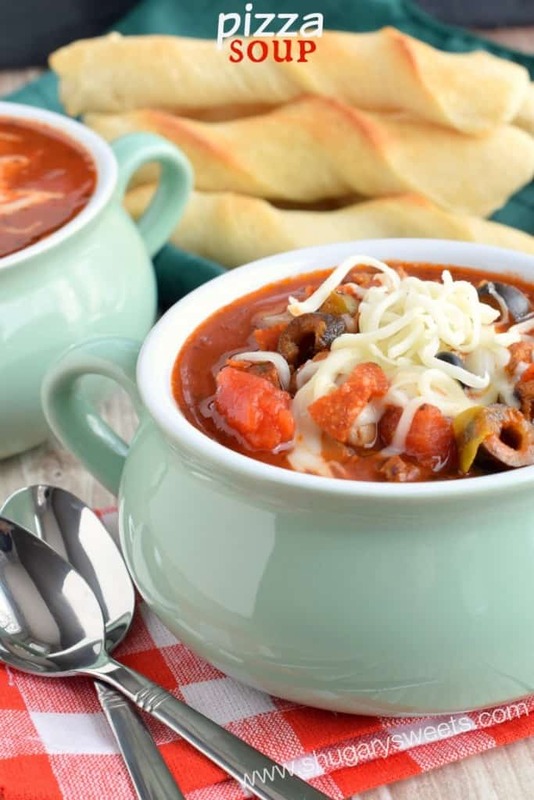 However, he loves pizza, so this may be the perfect soup for him! I cannot wait to eat allthepizza this November!! Love this soup!! You had me at pizza. 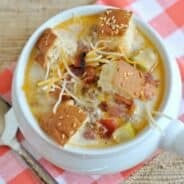 Pizza Soup? Oh YEAH! We love trying different pizzas and putting through taste tests too!!! Now I’m craving some deep dish pizza, but I’m trying to do no carbs this week! Good thing soup works for times like this! 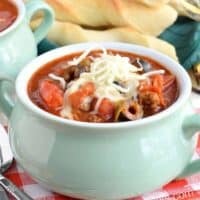 Pizza soup is a fav here but I have never done it in the crock pot! Awesome to know it works! You had me at pizza! Such a fun weeknight recipe for the fam! Sad to say I have never tried a deep dish pizza, I feel like I am totally missing out! 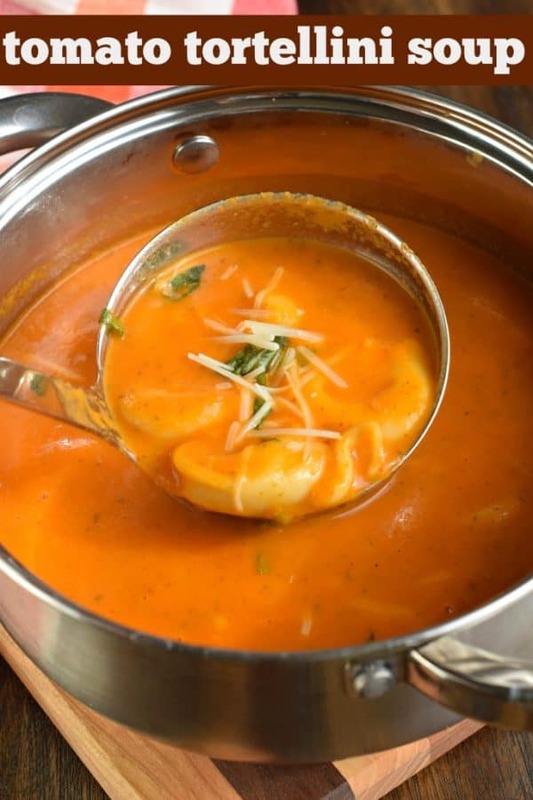 This is a soup I know we will be making on repeat! I need a bowl of this right now 🙂 The breadsticks look yummy too. Can you share the recipe for them? what a great idea. pizza in a soup! yum! i cant wait to try this! This is such a unique idea! I can’t wait to try it! 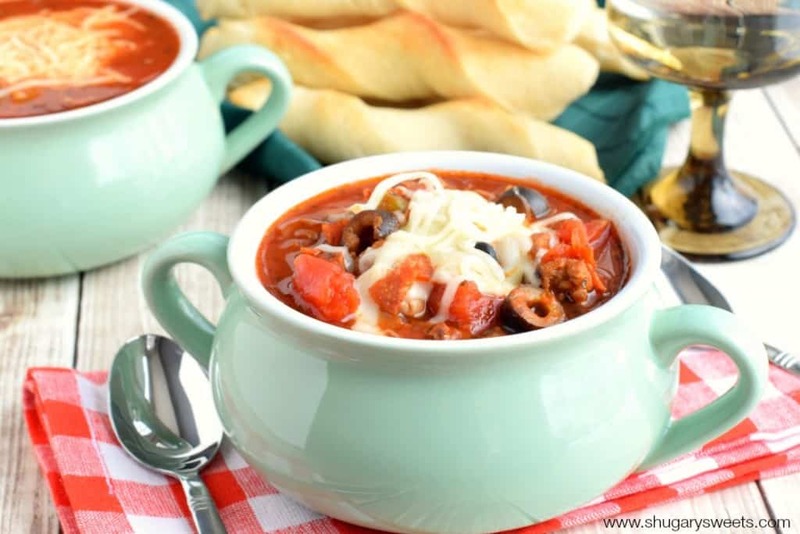 When I told my boys about this soup, they were so excited to try a soup called PIZZA SOUP! haha! They loved it and I’ll for sure be making it again! What a fantastic idea! My kiddos will take pizza any way they can get it – they will LOVE finding the little pepperonis in this soup! So glad I tried this recipe! The perfect family recipe.